In this post I am posting the solution for Nokia X2 Display Problem and LCD Connector Ways jumper points. If your Nokia X2 LCD Display is not working properly consult the diagram below. 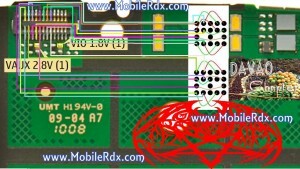 Before making the jumpers I have marked for Nokia X2 Display Connector in this diagram check and make sure that a busted LCD or LCD connector is not causing this problem. If you are sure that your LCD and Display connector are in good shape or If you have damaged the LCD Connector prints move on and make the jumpers as shown in this diagram. Here Are Display Problem LCD Connector Ways Jumpers. Please Observe Carefully. If the above procedures doesn’t fix the problem the possible faulty is the main engine IC. Try to re-heat or rework it.